RISCON is Japan's largest risk management trade show, an annual event with a reputation for attracting leading security companies and showcasing latest products and technologies for preserving public security and welfare. Los Angeles, CA, October 17, 2017 -- RISCON is Japan's largest risk management trade show, an annual event with a reputation for attracting leading security companies and showcasing latest products and technologies for preserving public security and welfare, including in the all-important fight against terrorism and threats of nuclear and chemical attack. Overshadowed by the growing tensions with North Korea and the increased threats to regional players such as Japan and South Korea, RISCON 2017 was all the more relevant and, in this context, Castellex was pleased to have been able to present Air series NBC/ CBRN air filtration systems at this prestigious event and demonstrate our most user friendly Castellex Air350 series NBC Air Filtration System for nuclear bunkers/ survival shelters. Over the three days of the event, from 11-13 October, potential customers ranging from leading security companies to private individuals showed great interest in our products and we look forward to further cooperation and discussion with all of these moving forward. We at Castellex fully recognise that North Korea, with an unstable dictatorship coupled with nuclear, biological and chemical capabilities and aspirations, is a major security risk to its nearest neighbours in particular. In the event of conflict or accidental miscalculation, Japan and South Korea are likely to suffer the greatest destruction and loss due to their geographic proximity. In recognition of this, the ultimate aim and promise of Castellex is to provide our customers with highly effective, high quality, user friendly NBC Air Filtration Systems designed for nuclear bunkers and survival shelters. We recognise that preparation and readiness equals life preservation and we do our utmost to provide everything in our power to assist and safeguard our customers. 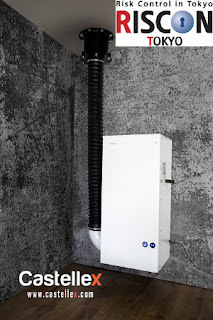 For further discussion relating Castellex Air350 at RISCON 2017, to the specifications of the Castellex Air350 series NBC Air Filtration System and how this top range product can be tailored to your needs, we look forward to hearing from you.